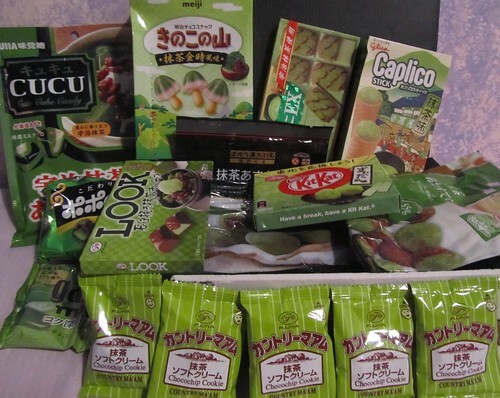 A box of green goodies from Japan! I’ve been home exactly two months and am still missing Japan so much. I get my little Japan-fixes whenever and wherever I can, but it’s still hard some days. As I’m sure you can imagine, I was thrilled to come home to a box from Japan yesterday, and even more thrilled to open it and find it was full of…. green tea goodies! There are sweets, cookies, chocolate… so many things to cause a huge diet-fail (and so many things to make me smile). One of the highlights was this Zunda Kit Kat which I’ve been after since I first heard about it online. 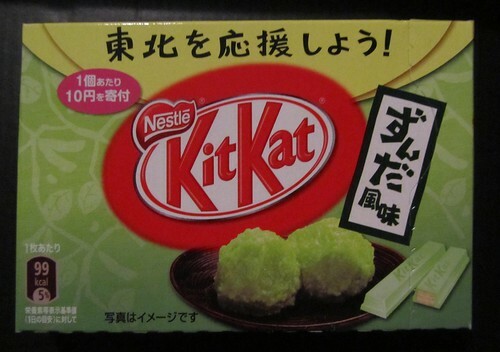 This Kit Kat is being sold to help raise money for the Tohoku region of Japan. You can read more about it over on Kit Kats! I’m so lucky to have a great friend in Japan who can send me goodies to make me happy! ありがとう　和江さん!